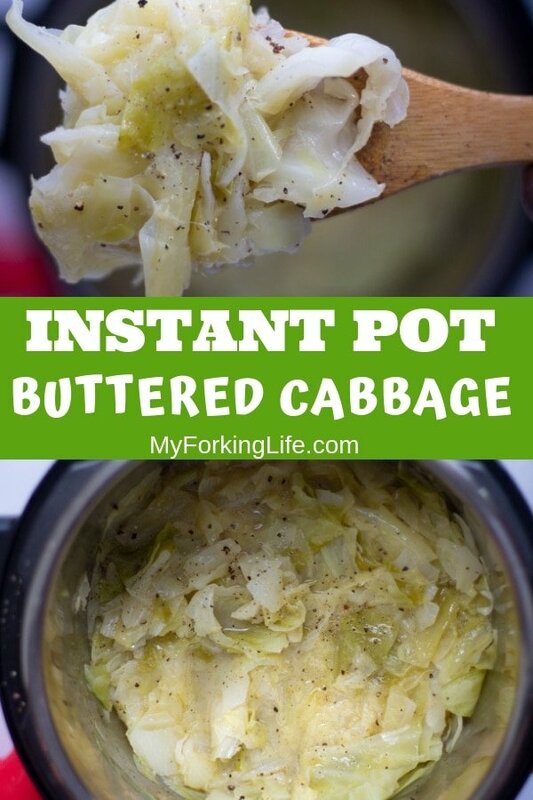 This Buttered Instant Pot Cabbage is the easiest way to make delicious cabbage in your Instant Pot. Only 5 ingredients in this delicious side dish. It’s so simple. 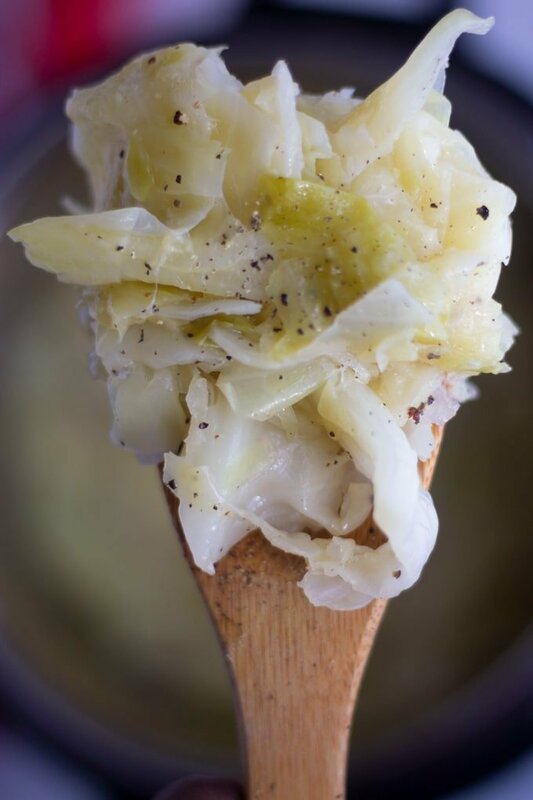 Yes, this Buttered Instant Pot Cabbage is so simple that I almost didn’t make it a blog post. But I promised I’d post more recipes that weren’t too complicated yet still were great on flavor. So here’s to delicious cabbage made right in your Instant Pot Pressure Cooker. My family and I love to visit different churches in the rural parts of North Carolina. One of our favorite things to do after church is to…eat. One of our favorite churches feeds us after service and it’s some of the best soul food cooking you can have. I’m talking baked chicken, macaroni and cheese, and cabbage. 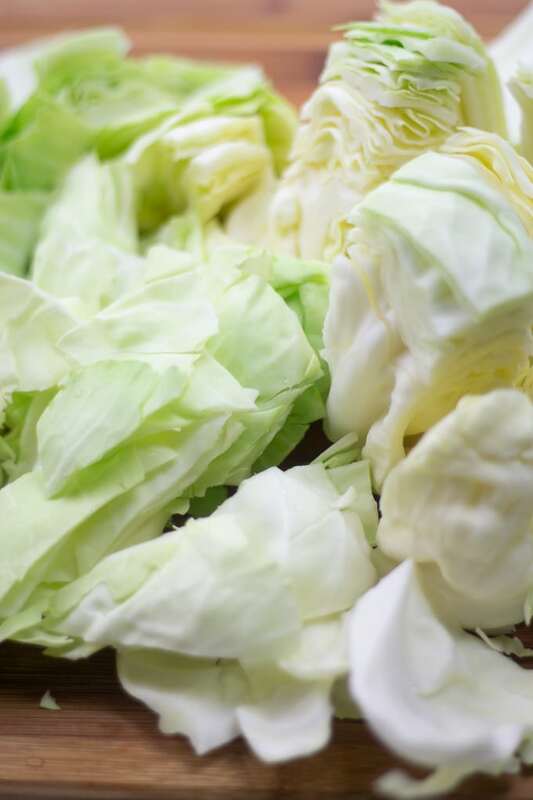 The cabbage is perfectly cooked, perfectly seasoned, and so very delicious. So I converted the recipe to my Instant Pot so I can have cabbage whenever I want. 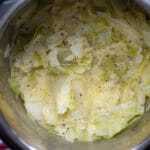 In order to cook this cabbage in the Pressure Cooker, start by washing and cutting the cabbage. First, cut the cabbage in half. Then core the cabbage by removing the tough stems. I cut a “V” shape around the core and remove it. Lay the cabbage side by side and cut each half into four separate pieces. Then, slice across the pieces and cut cabbage into 1 inch pieces. It shall fall apart into a ton of pieces but that is ok.
First, add your liquid to the insert. I use 1 cup of chicken broth. Then add your butter and lay your cut cabbage on top. You can fill your Instant Pot to the top so long as the cabbage doesn’t interfere with closing of the lid or touch the lid when closed. The cabbage will shrink when cooking. I do the same thing when I make my Pressure Cooker Collard Greens. Once you’ve placed your cabbage in the pressure cooker, cover and cook on high pressure for 6 minutes. Once your timer is done, do a quick release and add your salt and pepper. How long does it take to cook cabbage in a pressure cooker? That will honestly depend. I prefer 6 minutes as it makes the cabbage nice and soft but not too mushy. 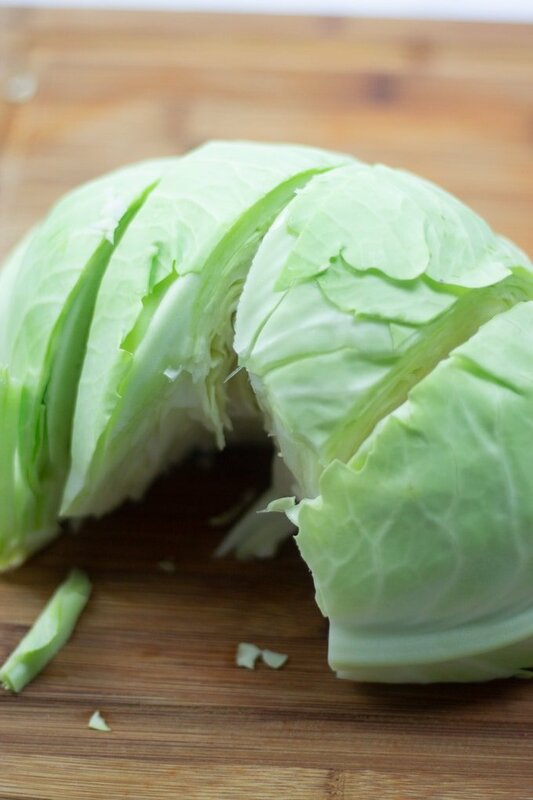 For cabbage with a little more crisp, you can reduce the time to 4 minutes. My pressure cooker takes about 15 minutes to come to pressure with this recipe. Yes. You can sub vegetable broth for chicken broth if you want to make it Vegeterian. Add other vegetables like carrots or thick cut potatoes as well. 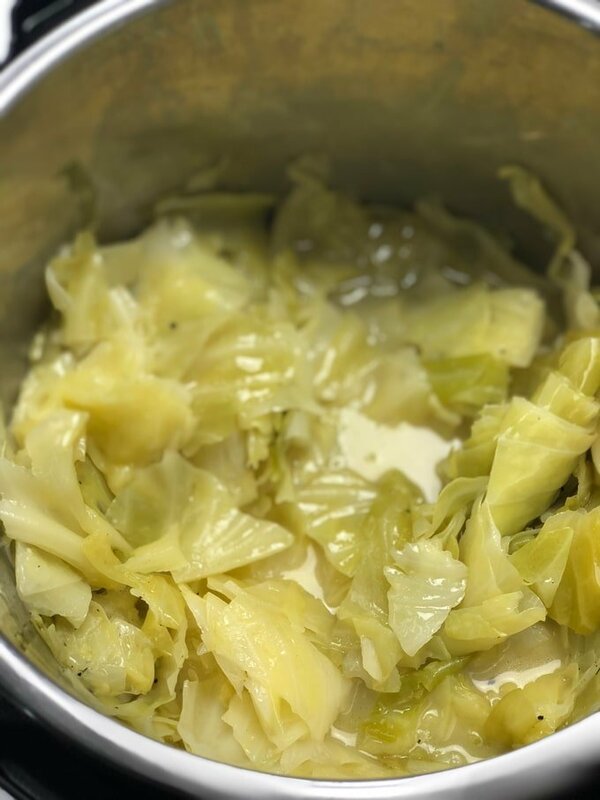 This buttered Instant Pot Cabbage is easy and delicious and can be made right in your Instant Pot Pressure Cooker. It’s one of our favorite ways to eat cabbage. Cook on high pressure for 6 minutes. 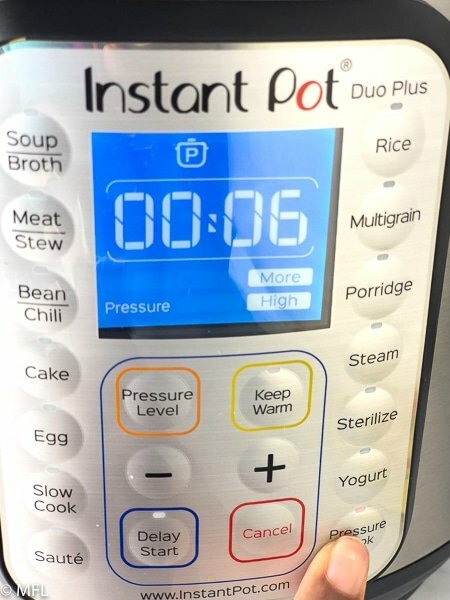 Once done, press Cancel on Instant Pot. Quick release by slowly moving valve to “Venting.” Once all pressure is released, open lid. Stir cabbage. Season with salt and fresh ground pepper to taste. This recipe was prepared in a 6Qt Instant Pot Duo. You can substitute vegetable broth for chicken broth. You can also omit the butter, but then it wouldn’t be buttered cabbage. Serve with a slotted spoon. I highly recommend investing in a good black pepper grinder. There is nothing like fresh ground pepper. Add your chicken broth, butter, to the Instant Pot. Then add your cabbage on the top. Press Pressure Cook (Or Manual on some models) and adjust timer to 6 minutes by using the “+” or “-” buttons. Make sure it’s set to High Pressure. 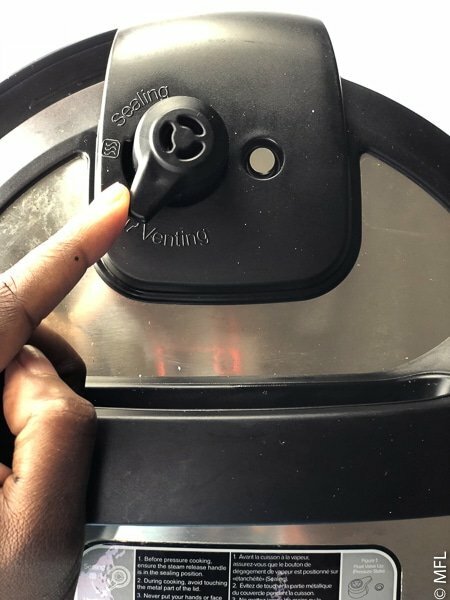 When timer goes off, press Cancel and carefully switch the valve from “sealing” to “venting” Some people use a spoon or dish towel to avoid the steam. 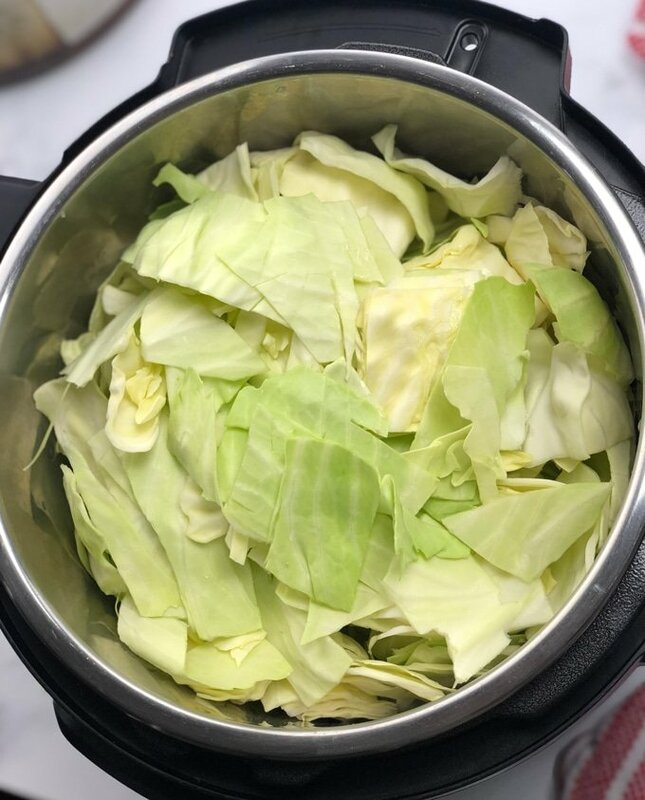 Once all the pressure is released, open the Instant Pot and season the cabbage with salt and pepper. Stir and serve with a slotted spoon. I used the remain liquid to cook potatoes and then mashed them up in it — delicious. Omgosh! So good. Thank you! Yum! and cooked for 7 minutes medium. user of the pressure pot. Time saved cooking is amazing. 1 pot meals. Thank your forkinglife. Hi Baroness, I would add it after the cooking cycle (if it’s cooked canned corned beef) or cook it separately. Thank you, I love cabbage and look forward to trying this recipe. I am impressed with the detail of your tutorial, and appreciate the list of the times for each step. I am new to instapot cooking and still intimidated, so that step by step really helps. I often worry when it seems to take so long to come in pressure. Very good! Delicious by itself. I served it with Italian spiced turkey sausage and onions, and it was even better when blended with the turkey sausage. Thinking about all the ways I can combine it with other things. It’s a keeper! Thanks Debbie! Your addition of turkey and onions sounds amazing! I’m keto! Do you know the net carbs on this? 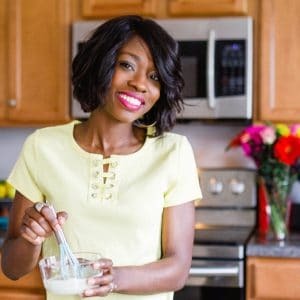 Hi Tami, I’m sorry, I don’t know the net carbs on this recipe. Delicious!!!! Made it as directed, super easy. Hubby loves it too. OMG! This was delicious! I liked the smaller pieces of cabbage the best. I may try it using half the amount of butter next time. I also added parsley after cooking. Will definitely make it again. Thanks! Awesome, so glad you like it Teri and thanks for letting me know. This was amazing! Thank you for sharing your recipe; I also threw in some carrots. I made the cabbage and then added fried pork sausage when I served. 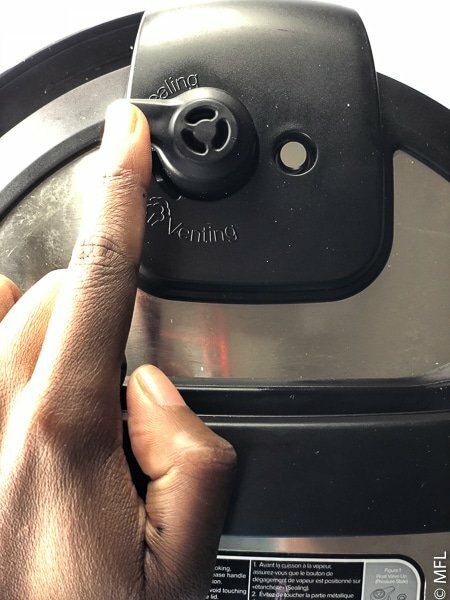 Thank you for the pictures of what to set the instapot on as I often find folks do not give the settings in their recipes and I am not great with figuring out how to set the instapot. MANY THANKS!!! You’re so welcome Debi. I love your addition of carrots. I do that sometimes too. Such a quick and easy veggie side. I’m going to be using 4 head sof cabbage, so would I need to multiply the other ingredients by 4 too?? I haven’t doubled it. I can’t fit more than 1 head of cabbage in the instant Pot. If you do use more cabbage, I would leave the other ingredients the same amount.